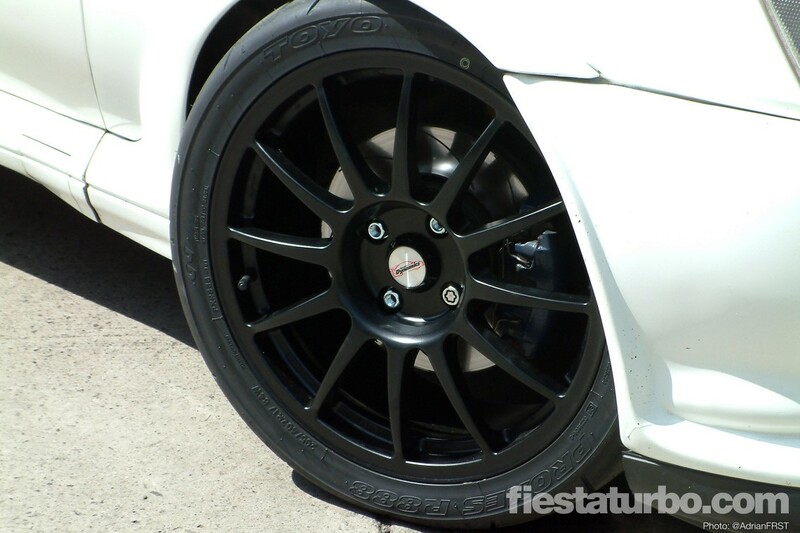 One of the most asked questions regarding Fiesta styling is “Can I fit 17” wheels?”. The answer is yes, but there are several things that you will need to do in order to accomodate this size of rim. The arches on a Fiesta were only made to accommodate the 13” or 14” standard wheels that Ford fitted to the car. If you fit your 17”s straight on they will catch on the arch lip and scrape on the plastic arch liners. Some cars, such as Saxos, require major effort, including relocation of bumper mounts and washer tanks to fit 17”s, fortunately, this isn’t necessary on a Fiesta. 2) Alter the rear suspension set up. The problem here is the wheels making contact with the spring cups, or the spring itself on coilover setups. On later model Fiestas, those made after 1994, this is not evident as Ford changed the design of the rear shocks, but if the Ford shocks are replaced with aftermarket items or coilovers, the issue will arise. 3) Limit the steering rack. The size of the wheels may cause the tyre to come into contact with the crossmember inside the front arches. This is fairly simple, attach a couple of hose clips to the steering rack. This article will explain what work is required, both with the arches and the suspension. The article is written assuming you have an XR or RS model with the plastic arch extensions. If you don’t, ignore the steps relating to them. If you image looking at the wheel front on (as in if you are looking at the the front or rear of the car). Then imagine that you have X-ray eyes and can see through the wheel and see the face that mates up to the hub. Offset is the distance (in mm) that this face is from the the centre-line of the wheel. The standard Ford offset is ET35. Obviously if the face is to the right of the centre-line (looking at the left hand wheel on the front of the car), the wheel will stick out further. If it is to the left of the centre-line then the wheel will stick in further. Obviously, the idea is to get a matching offset (+ or - a few mm) to the standard car so that the wheels do not stick out too far (as they will touch the arches on cornering or with heavy loads) or stick in too far (will foul the shock absorbers / springs). Incorrect offset can be corrected using wheel spacers, for instance 3mm spacers will change ET38 to ET35. If the wheels were are ET25 they would protrude 10mm too far, this cannot be corrected using spacers. If possible, stick to a 7 inch width. Most 17”s are this wide, but some manufacturers only produce rims in a 7.5”. Momo and Smiths are two companies that do this. 8x17” may fit, but the trouble with 8” width is that the fronts will stick out past the edge of the arches, which will fail an MOT. When running 17”s, 205/40s are the recommended tyre size. The exact width can differ quite a bit between different manufacturers, so a 205 Pirelli may be narrower than a 205 Yokohama for instance. The Toyo Proxy T1-S is known for being a fairly narrow 205. The work involved here depends on how much you want to lower the car. It makes sense to remove as much as possible thereby eliminating any chance of the wheels catching. The first step is to remove the arch trims to leave the wing and metal arch lip visable. The front wings do not carry any of the load of the car, all this is done throught the crossmembers, so it is possible to remove large amounts of metal without compromising the strength of the car. The splash guards will need to be taken out. They can be trimmed and refitted later or left out completely, necessary if the car is very low, although this can lead to grit and dirt inside the engine bay so it’s a good idea to modify them to fit further up. Another idea is to cut them up and make smaller splash guards that fit in key areas, such as under the air filter. The drilled holes in the wing that the bodykit arch trims bolt to will now be visable. The metal lip needs to be removed completely. For maximum clearance it can be cut back to just before the kit mounting holes. This will obviously look a little odd until the trims are refitted and in the case of non kitted cars, just remove the lip. An air hacksaw is an ideal tool for this as the speed of the blade motion gives a neat cut. After cutting, repaint any areas of bare metal to prevent corrosion. The topmost bolt that holds the trims on will need to be ground down, as this will catch the tyre if left. Upon refitting of the trims use bodykit adhesive or an adhesive trim repair type tape. Next cut the lips back on them completely. This can be done with a sharp stanley knife which also gives a neat cut. They should be trimmed flush at the top and then begin to taper out and the cutting line should just pass near where the screw hold them on near the bottom of the doors. The rear arches don’t require cutting as much as the front, due to the rear wheels not turning. However there is a welded seam on the lip, which limits the amount of metal that can be removed. As it is two panels welded and folded over, the metal is thicker and the air hacksaw may not be sufficiant to cut through it. In this case an angle grinder is the solution. Another alternative is to get the rear arches professionally rolled using a special tool. The paint is heated up to avoid cracking then the rolling tool is attached to the hub and a wheel on the arm folds the metal back. There are a couple of methods for doing this. The first is to space the wheels out to clear the spring cups or springs themselves. The disadvantage of this is that it will bring the wheels closer to the arch where they are more likely to catch. Wheels can be spaced out in two ways. The first is to use regular wheel spacers, click here for details on spacers. The preferred method is to use spacer plates. Click here for spacer plate info. Depending on the width of the wheels it may be possible to obtain the required clearance by simply removing the shock absorber, rotating 180 degrees and refitting. The spring cup is higher on one side than the other and in some cases rotating the cup is sufficiant. Special thanks to Mike Rainbird, Norfolk RSOC Chairman, and Paul B (mmogenuius) for their help with this article.